I wanted to give a special thank you to Leroy Cole. Without Leroy’s amazing knowledge and all of the information that he has generously shared with my son and I, the Cole registry would not be possible. As I mentioned in the page on the History of the Cole Motor Car Club of America, Leroy was instrumental in driving that very active club over the years. He also assembled a large collection of Cole history and artifacts that comprised of multiple truck loads in size. He has since passed on that collection to the Gilmore Car Museum and it is known as the “Cole Archive” in their research library. After we acquired our first Cole Motor Car, we met Leroy and he inspired us with his stories and deep knowledge of this amazing company and car. My son and I will carry on his dedication to the Cole automobile with the this registry and ensure that his hard work will continue on and be shared with others. Again, thank you for all that you have shared with and done for us! Three past Society of Automotive Historians (SAH) Presidents at the Gilmore Car Museum. Right to left. 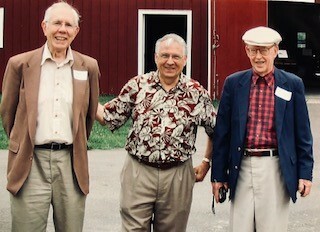 Sinclair Powell 1997-1999; Leroy Cole,1999-2001; Dale Wells,2001-2003. All have donated their archives to Gilmore. Dale worked with the Classic Car Club library.